The Eternal City. We are back in Rome! First stop – a caffé, for a proper Italian cappuccino. And look at this pizza – with fresh bufala, tomatoes and arugula. Wonderful, even at the airport. 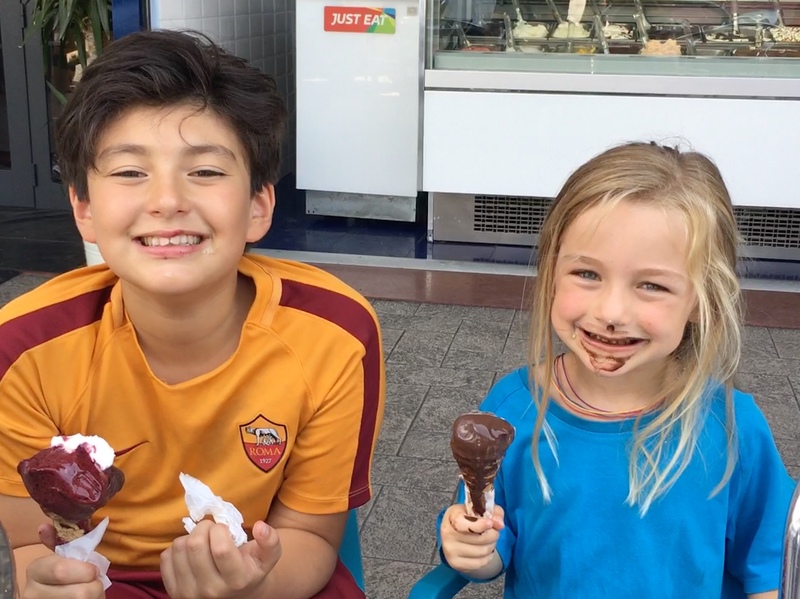 We spend a few days here visiting family and pursuing our favorite pastime – eating gelato. Yum! There’s no better way to beat the heat on a Roman summer day. And now to get some sleep before traveling up to Chianti. We visit the ever smiling Dario, butcher extraordinaire. He has beef steaks a foot tall, and rope after rope of handmade sausages. Armed with a glass of red wine, we dig into a plate of tartare, followed by polpette, followed by a Fiorentina steak – you get the picture! The town is unhurried and peaceful, as everyone seems to enjoy living in the moment. There is color everywhere – from the green cypress trees, to the red roofs, colorfully painted cow statues, and the farmers market. They have peaches and apples, lemons, watermelons, plums, cherries, eggplant, zucchini, strawberries…Shall I go on? There is a wonderful selection of summer dresses and hats – just perfect for this warm weather. After feasting on succulent peaches, we take a seat and rest under a pergola. The buildings, with their red tiles and local stone, set in blue rolling hills covered in verdant green, make a perfect summer idyll. We head back to the hotel for a dip in the pool, and an aperitivo. Tomorrow, it’s off to the Campionato Italiano Della Bugia – the Italian Liar’s Championship. This is the land of Pinocchio, after all.